The days begin with Traditional Sung Mass at 11am in the splendid Pugin chapel at the school, and continue with talks and catechesis for adults and children of all ages. All are welcome; there is no fee. If anyone would like to know more, please contact me. Friday 12th December saw the first Missa Cantata in SS Gregory & Augustine to be served by parishoners and accompanied by the Parish Choir. Fr John Saward preached on his recent visit to Lourdes. The church is undergoing restoration. The floor has been sanded, and the wooden pannelling on the East wall has been prepared for painting. The curtain behind the altar is new; eventually it will be used for the church's 'Lenten array', but for the time being it hides the unfinished work on that part of the wall. 1. The LMS Committee has not cancelled the Oxford Training Conference, and Merton College has not indicated to the Society that permission to hold the Conference has been withdrawn. 2. Mr David Lloyd’s views concerning the Oxford Conference held in July 2008 were considered by the LMS Committee three months ago and did not receive the support of the majority of its members. 3. The LMS Committee – including Mr Lloyd – is unanimous in its commitment to the implementation of the Motu Proprio, ‘Summorum Pontificum’, and consequently to the training of clergy to celebrate Mass in the Extraordinary Form. 4. The leaking to the press of Mr Lloyd’s confidential e mail, and the attempt to link this e mail with the LMS Committee’s recent decision concerning the administrative arrangements for the Conference are mischievous. But only if they are Traditional Masses. See the New Liturgical Movement for the LMS press release on the official response of the Ecclesia Dei Commission, which contradicts the suggestion of the Liturgy Office of the Bishops' Conference of England and Wales that the actual feast days have been transferred. On the contrary, when these feasts are celebrated on the Sunday - as requested by the bishops - they are celebrated as 'external solemnities', something possible and in fact quite common under the 1962 rules. (I.e., for the benefit of the faithful unable to make an important feast during the week, it can be repeated, a bit like a votive Mass, on the Sunday.) The actual day is the traditional day - as will be reflected in the breviary, by vigils, octaves and so forth. The Oxford Oratory is undergoing major redecoration at the moment, but that did not prevent us from having a Missa Cantata for All Souls today. Fr Anton Webb sang the Mass surrounded by scaffolding. The blessed sacrament has been moved to the chapel of the Sacred Heart (which is next to the sancturary, on the Gospel side). The workmen had to suspend their operations for the duration of the Mass; they could be seen slinking back once it was over. The singing was done by the Schola Beati Thomae Abelis of the OU Gregorian Chant Society. I have now got round to writing a fuller report on this and have got the most important pictures together - though more are on their way to me. There was an article about it in last weekend's Tablet, and there will be a report in this weekend's Catholic Herald, and there are more pictures and commentary on the background of the pilgrimage on this blog here, and on the pilgrimage itself on the New Liturgical Movement (1, 2, and 3), on the Gregorian Chant Society blog, and on Br Lawrence Lew's Godsdogz blog. On Saturday 25th October Bishop William Kenney CP, an auxiliary bishop of the Archdiocese of Birmingham, blessed a plaque in honour of four Catholics martyred in the city of Oxford. 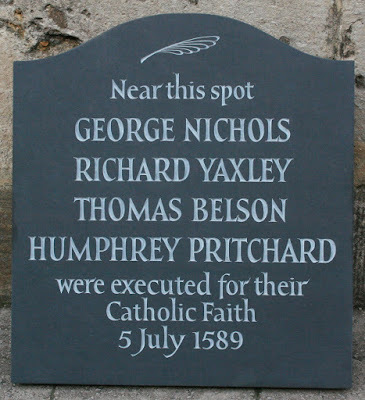 The four, who were beatified in 1987, included two secular priests, ordained in Douai, George Nichols and Richard Yaxley, and two laymen: Thomas Belson, a young member of a local land-owning family, and a Welshman, Humphrey Pritchard, who worked in the Catherine Wheel Inn in Oxford where they were captured. They were executed in 1589. 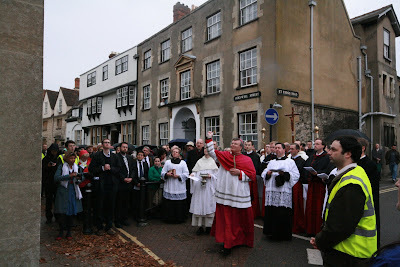 Bishop Kenney, on behalf of Archbishop Nichols, led a procession of 180 people in the footsteps of the martyrs, from the site of the Bocardo prison where the priests were held (in Cornmarket Street) to the site of the town gallows where they died (in Holywell Street). Bishop Kenney preached on the meaning of martyrdom for Catholics today at the traditional Solemn High Mass which preceded the procession. The pilgrimage, the fourth annual pilgrimage in honour of Oxford’s Catholic martyrs, was organised by the Latin Mass Society. 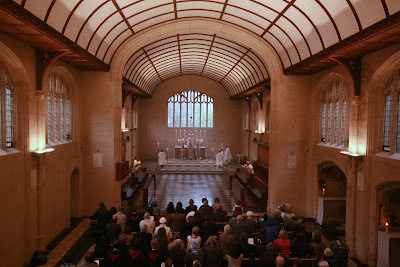 Mass took place in the Priory church of the Dominican community in Oxford, Blackfriars, which was packed to the doors for the occasion. The Cantores Missae under Mr Charles Finch sang Victoria’s Missa Traha me post te. The Te Deum and other chants were sung on the procession by the Schola Beati Thomae Abelis of the Oxford University Gregorian Chant Society. The congregation included a coach-party from St Bede’s Clapham Park, and others from as far as Wales, Sussex, and Staffordshire. Many local clergy attended, as did Bishop Jarrett of Lismore, Australia, who was visiting the area. Bl. Thomas Belson has living descendants in the Oxford area, and a number of these, led by Dorrien Belson, attended the proceedings. Other historic local Catholic families represented at the blessing included the Mockler-Barret family of Milton Manor and the Stoner family of Stoner House. The colleges of Brasenose, the alma mater of Bl George Nichols, and Oriel, which absorbed St Mary Hall, where Bl Thomas Belson studied, were also represented. The celebrant was Fr Dominic Jacob of the Oxford Oratory; the deacon Br David Rock OP, and the subdeacon Br Lawrence Lew OP. The serving team was provided entirely by the Dominican community. The day’s events were concluded with Benediction of the Blessed Sacrament led by Fr Armand de Malleray FSSP. Quite frankly, I have become more depressed over Traditionalist (or Conservative) Catholics deciding to escape into their little enclaves than over practically every other development in our movement. Many have fallen prey to all manner of non-Catholic thinking and behavior in consequence, none of which is investigated because, once again, the power of the name - Traditionalist Catholic - seems to stand surety for their ideas and actions. 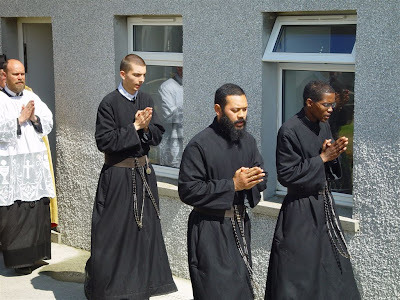 I have met all too many well-meaning Traditionalist Catholics who have retired to their “little houses on the prairie” and who, in everything from their dress to their intellectual life, have become nothing other than atomist modernists in Amish clothing. I have met some Traditionalist Catholic home schoolers whose loathing for serious thought and culture is more naturalist and revolutionary than that of Jean-Jacques Rousseau. I have met stern Traditionalists who out-Jeremy Bentham Jeremy Bentham. And, as noted in one way or another throughout this interview, I have met all too many Traditionalist and Conservative Catholics whose Church Fathers are really the Founding Fathers; good-willed people who, in practice, show that they really think the main event in Sacred History came not with the birth, death and Resurrection of Christ, but with 1776. One can see this even on the purely natural level. Many of the home schooling history texts produced by “our side” begin with America rather than Mesopotamia. I have even read statements by orthodox home schoolers which proclaim openly the need to reject as heresy any work that mentions a criticism of an American political tradition firmly rooted in one of the most dangerous of Enlightenment thinkers, John Locke. We accept too much long-standing Anglo-American “custom” as though it were the real Tradition of the Church and the duty of Traditionalist Catholics to protect. This is exactly the same problem St. Gregory VII complained of in trying to strike at the Caesaro-Papism of the Eleventh Century. Christ, as he noted, came to teach Truth, not custom. Many Catholics did not know the difference between the two. Hear me talking about it with Ed Stourton here: 21 minutes 28 seconds in. (I got four minutes!) It will be available for seven days. The Oxford Pilgrimage was a great success, with numbers greatly exceeding expectations: Blackfriars was packed, the procession was enormous, numbering at least 170 people. Here is a picture of Bishop Kenney blessing the plaque. I've put more information and photos on the New Liturgical Movement here. High Quality Colour Wall Calendar produced in harmony with the 1962 Roman Missal with supplements from the British Isles. 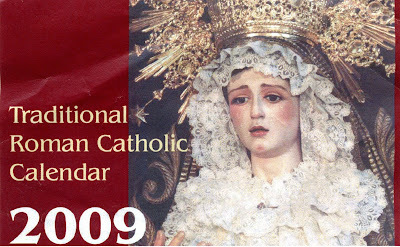 The theme of the Calendar is the 'Semana Santa' of Seville. 3. Vocation retreat: January or February 2009. 2. On Tuesday 16th December in Kent. 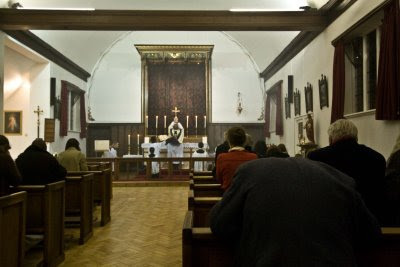 Ø Lastly, you are welcome to visit me at the FSSP booth at the Towards Advent Festival of Catholic Culture at Westminster Cathedral Hall, Ambrosden Avenue SW1, London, on Saturday 8th November 2008 from 10am to 5pm. Please be assured of my prayer for you and for all those dear to you. This is a peaceful prayer witness, in which Fr John Saward of SS Gregory and Augustine leads the Rosary outside the church, while inside others pray before the Blessed Sacrament exposed in a monstrance. Do join us! The one on 25th is the same day as the Oxford Pilgrimage in honour of the Catholic martyrs of 1589: Solemn High Mass is at 11, and the procession is at 2pm. Yes, you can do both! Not very good ones, perhaps, but they give some impression of the scale. We filled the Brompton Oratory - there must have been getting on for 3,000 people. The line of the procession disapeers into the distance in both directions. We've just passed Victoria Station. Below, the statue and its bearers pause outside the Oratory to let the rest of us file intot the church, before processing in. Following the great success of our first Traditional Sunday Mass for children in the *Little Oratory* last month, we shall be having another one on *SUNDAY 19th OCTOBER *at the same time, 11.15 am. Hope to see you, and please spread the word! Latin Mass Society. Please download a registration form today and return it no later than 31 Oct 2008 to the LMS office or telephone the LMS on 020 7404 7284. All the forms are here. Daphne McLeod: liturgy or catechesis? Daphne McLeod has written an article suggesting that Traditionalists are not pulling their weight in the effort, spearheaded by her group Pro Ecclesia et Pontifice, to oppose bad RE textbooks and the like in Catholic schools and parishes. It is discussed on Catholic Action UK, Hermeneutic of Continuity, and Catholic Truth Scotland (the comments on each of these are interesting). I hope I am in a good position to reply to Mrs McLeod’s important article, on behalf of Traditionalists, because I assume that she regards me as a positive exception to her generalisation. Speaking about Traditionalists, she says they devote all their time and resources to promoting the Traditional Mass, whereas the smaller but indomitable group of which she is a member devotes all its time and resources to restoring catechesis. As a local representative of the Latin Mass Society, many of my leisure hours are indeed devoted to promoting the TLM. On the other hand, I am also a founder and participant of the St Catherine’s Trust Summer School, which addresses precisely the failure of modern catechesis, in the form of a week-long residential summer school for children, where Catholic history and culture, but above all catechesis, is delivered. Mrs McLeod has not only supported this project in the abstract, but has been a member of staff at the Summer School for the last two years, so I know she approves! So I, for one, don’t fall into either of these categories: I divide my time between promoting the TLM and promoting catechesis. However, I am not alone in this. The Traditional Catholic Family Alliance, with which I am also heavily involved, is a group of families committed to the TLM who get together to ensure, among other things, but importantly, sound catechesis for their children. Related groups of Traditionalist home-schoolers in different places meet more frequently to give each other mutual support; they recently held their first conference on the subject. The Traditional Catholic community in England is deeply concerned about Catholic education in general, and catechesis in particular. We have no illusions about Catholic schools; we have no illusions about modern RE textbooks; we have no illusions about the nature of modern seminary training; and we are devoting enormous quantities of time and effort into doing something about it. The commitment and sacrifice of Traditional Catholics who teach their children at home, for example, not infrequently crosses over from the admirable to the heroic. It is very surprising to me that Mrs McLeod should imagine that Traditionalists complacently send their children to ordinary Catholic schools expecting them to receive sound catechesis. This is simply not the case. The key to her mistake here may be indicated by her phrase, describing her own work, that it aims to bring good catechesis back to ‘our schools and parishes’: possibly, Traditionalists may seem thin on the ground in the places her supporters are fighting their battles. But that is not because they are being complacent about the local Catholic school, or the local parish family Mass, but because many of them are so fed up with them that they are teaching their children at home, and taking their children to a Traditional Mass down the road. In both cases these are not easy options: they usually require great efforts to set them up and maintain them. But in terms of ensuring good catechesis for their children, they work. Those engaged in trench warfare in schools and parishes or elsewhere can lose sight of the wood for the trees. Daphne McLeod tells us that good catechesis is key to the crisis in the Church: I don’t disagree. But this cannot be done in isolation from the other issues which beset us: it is impossible to put in the key-stone, if that is what it is, without the rest of the supporting arch. It seems to me that Traditionalists are rather good at keeping a perspective on things. Traditionalists’ concern with the liturgy has not prevented them from having a deep commitment to Catholic education, to spirituality, and to the Pro-Life movement. But what of Mrs McLeod’s argument that the ‘new catechetics’ was the historical cause of our current problems? I have no doubt that the countries which escaped this plague, under communism or in Africa, are better off as a result. No country, however, has escaped unscathed from the crisis in the Church. It is unfortunately very difficult to compare Western countries with countries with completely different social, economic and political conditions, and treat the others as a kind of ‘control group’ for examining the effect of the new catechetics. One reason why the seminaries are full in Poland is that many of them were closed down under the communists. One reason why they are full in Nigeria is because their inmates are given something approaching a Western education and lifestyle. 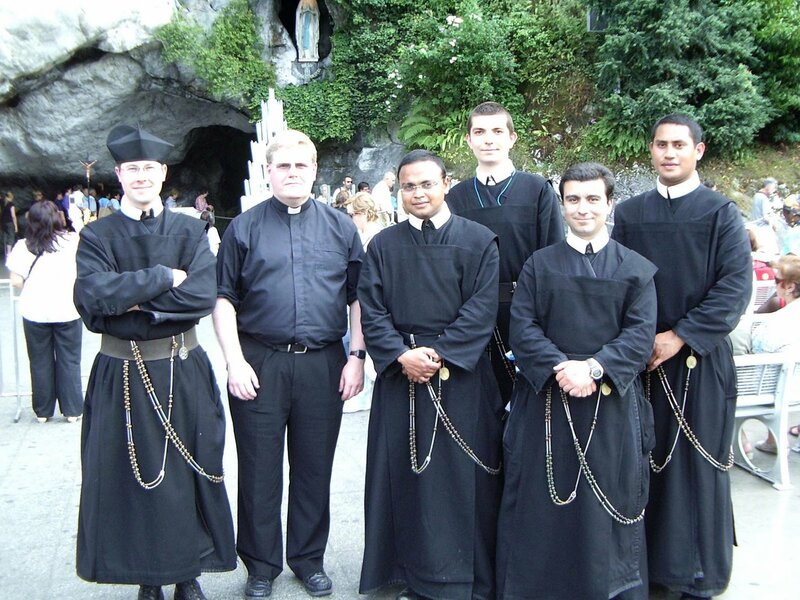 That doesn’t mean the seminarians are insincere—it may only mean that their families are more supportive—but it certainly makes a difference. But there is a more relevant historical example of people affected by the new liturgy who were not affected by the new catechetics, namely the non-teaching adult population of the Western world in the decade after the imposition of the New Mass. They had received traditional catechesis, but nevertheless a large proportion of them ceased to practice the faith in the course of the 1970s. What we don’t have is a case where the new catechetics was imposed and not the new Mass. But there is a very simple reason for this: it would have been extremely difficult, if not impossible, to do it, because in a thousand ways the prayers and ceremonies of the Mass would have contradicted it. The modernists who imposed the new catechetics did not get rid of the TLM as a convenient ‘red herring’: it was essential to their project. The counter-catechising nature of the Novus Ordo, as it is usually experienced, has been explored by no less a person than Pope Benedict XVI. In his book ‘The Spirit of the Liturgy’ he explains how, to give just one example, Mass facing the people creates the impression that the community is worshipping itself in a closed circle. The impression is insidious: it is repeated at every Mass one goes to, and bypasses intellectual arguments. The ‘closed circle’ is established in the mind as the objective reality of worship. The effect of ritual on belief is also the theme of Martin Mosebach’s brilliant book ‘The Heresy of Formlessness’: he talks, for example, of the shattering effect on ordinary Catholics of being told not to kneel before the Blessed Sacrament. They are being told, in a way which it is impossible to evade, that the Blessed Sacrament does not have the importance which demands the posture of kneeling. Again, Archbishop Ranjith has written about how communion in the hand undermines faith in the Blessed Sacrament. The effect of the liturgy on faith cannot be ignored: lex orandi, lex credendi. Mrs McLeod’s article is an appeal for unity among those who uphold the Catholic faith in its entirety and wish to see it restored. I would very much like to echo that appeal. 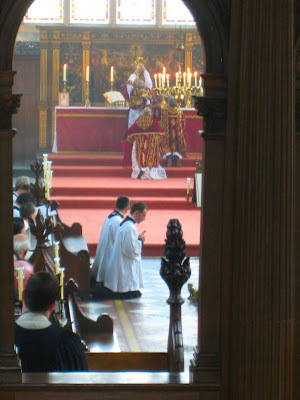 She suggests that Traditionalists should stop expending so much energy propagating the TLM, but energy is not finite as this suggests: it is the TLM itself which provides Traditionalists with the energy which Mrs McLeod acknowledges them to have, and would like to see applied to catechesis. If they seem absent from the fight, it is because they have chosen a different theatre of conflict—homeschooling and the nascent centres for the Traditional Mass—where their efforts are bearing visible fruit. My suggestion, accordingly, is this: that those outside the Traditionalist movement who share Mrs McLeod’s concerns should join us. The TLM is a rallying point for orthodox Catholics: not only does it give us strength and inspiration, but, in purely natural terms, communities and networks or orthodox Catholics grow up around it, providing mutual support and making collective endeavours possible. Anyone wanting to achieve something in the Church needs to connect with this network, not dismiss it. This took place yesterday as advertised. The Traditional Mass has been taking place twice a year in this historic Catholic chapel for some time; this was the first occasion it was sung. It is hoped that there will be more frequent sung Masses in future. The chapel is closely associated with Bishop Challoner, who consecrated it and was buried nearby until his body was moved to Westminster Cathedral. It contains some of his possessions, including a chalice. The house itself is open to the public; see their website. The celebrant was Fr Andrew Southwell. Hat-tip to the Hermeneutic of Continuity. It is from an article by the Cambridge academic John Casey; the whole of which is worth a read. This remote traditional community includes a young man from Oxford (in the pictures: the last of the three novices, and below, the one on the left), and we have been watching the process of their reconciliation with Rome with great joy. They need our support! Please say a prayer for them and take out a subscription to their newspaper, The Catholic, formerly distributed through SSPX chapels. The SSPX don't want to be friends with them any more, so we must show them the best possible welcome! See Cornell Society and their own blog (where the picture comes from). 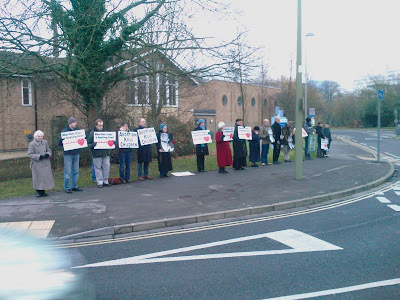 The monthly Prayer Witness against abortion, outside the John Radcliffe Hospital, took place on June 24th, with 15 people. This has now been called off! A very sad bit of news. See here. Fr Henry took part in the Oxford Gregorian Chant Training Day. 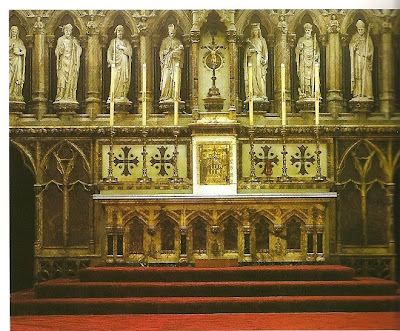 He has been given the church of St Vincent de Paul's (whose un-wrecked altar is pictured), in Liverpool (Toxteth), which is to be specially set aside to serve the needs of Catholics attached to the 'former liturgical tradition': a first in the British Isles, and an extremely important precedent. Fr Henry will take up residence in September. Please pray for the success of this exciting project! 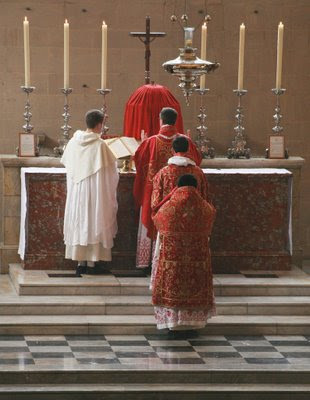 As last year, Mass and Vespers will be open to the public during the Latin Mass Society's 'Summer School' for the training of priests in the traditional liturgy (usus antiquior). 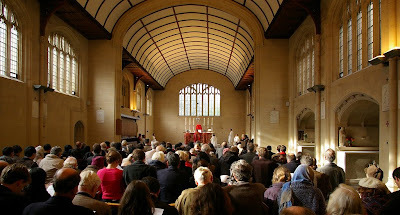 Mass Mon-Fri in Merton College chapel at 11.45am, and Vespers Mon-Thurs there at 6pm. Friday 1st July: Pontifical High Mass 11.45. Prior to the wonderful Pontifical High Mass in Westminster Cathedral celebrated by Cardinal Hoyos, he had a session with some journalists and made this and other important statments: see Damian Thompson's blog here. Update: The Oxford Pilgrimage will take place on Saturday 25th October. 2pm Procession and unveiling of the plaque, led by Bishop Kenney. 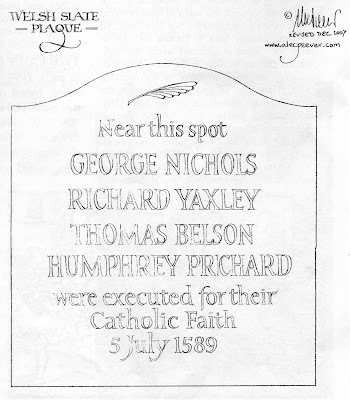 On 5th July 1589 four men, two priests and two laymen, died for the Catholic faith in what is now a quiet and unremarked Oxford street. It is always important to honour God in his martyrs, but it seems especially so in a city which has so much Catholic history, little, if any of it, marked in its public monuments. Permission has been granted by the owner of 100 Holywell Street (Merton College) and Oxford City Council for a plaque of this design (see picture). This almost exactly the site of the Town Gallows in the 16th Century, where the martyrs were executed. The martyrs of 1589 were beatified on 22nd November 1987. Bl George Nichols and Bl. Richard Yaxley were both secular priests, who had been trained at Rheims. Nichols had studied at Brasenose College, Oxford, and became famous as the priest who was smuggled in to Oxford Castle to reconcile a highwayman to the Church on the eve of the latter’s execution. Bl. Thomas Belson was a layman, a member of a Catholic land-owning family based in the county (at Ixhill, over the county border in Buckinghamshire); Bl Humphrey Prichard was a Welshman, an employee of the Catherine Wheel Inn, which was situated on the corner of Broad Street and Magdalen Street (where part of Balliol College now stands) opposite the church of St Mary Magdalene. 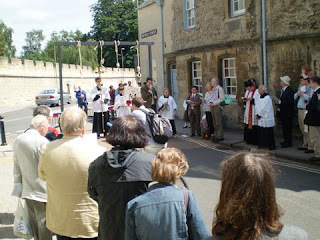 In 2005 the first Oxford Pilgrimage took place. Under the auspices of the Latin Mass Society, a Traditional missa cantata in St Aloysius was followed by a procession and Benediction. 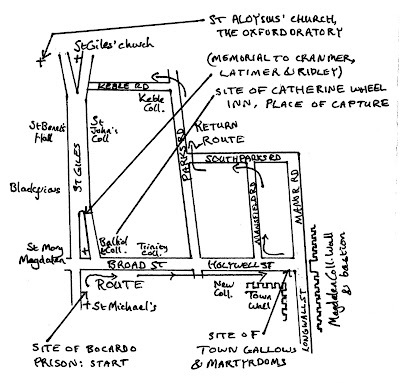 The procession followed the route taken by the martyrs from the Bocardo prison, next to St Michael’s church in Cornmarket, to the place of execution, which was marked by a large mock-up gallows. In 2006 the pilgrimage focused on Bl. 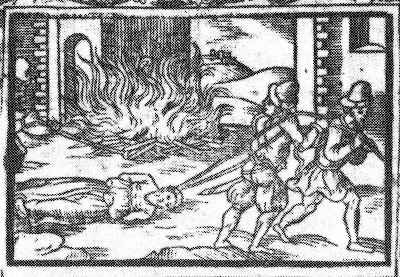 George Napier, Oxford’s other Catholic martyr, who died in 1610, and in 2007 it was the turn of the four martyrs of 1589 once more. By this time the Mass had become a Solemn High Mass, with Fr Dominic Jacob of the Oratory as the celebrant; the procession was led by his fellow Oratorian Fr Anton Webb. Sixty people joined the procession. These processions are important in the context of the plaque as they emphasise the significance of the actual site of martyrdom. The sites of martyrdoms have been the object of pilgrimage since the times of the early Christian martyrs, since offering prayers at the site of a martyrdom is a particularly fitting way to honour God in His martyrs. The plaque is a permanent, albeit relatively discreet, way of honouring the martyrs, just as the processions are an occasional, very visible way of doing so. Each also serves as a public witness to the martyrs and the Faith for which they gave their lives. or you can make a donation online here. Please specify what the donation is for. This petition will be presented to Cardinal Hoyos when he visits England on Saturday. Please take a moment to sign it. 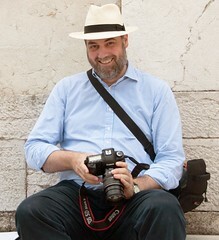 The petition is being promoted by Damian Thompson, whose blog also reports an extraordinary attempt by opponents of the Traditional Mass to sabotage the petition. Further details concerning the pilgrimage will be published in due course. It will start at the War Memorial near St Giles' church, which is where the Woodstock and Banbury roads begin to split. Look out for people wearing animal suits and carrying a sign saying "Save the humans!" See last year's walk here. This took place on Saturday, and was a great success. It was attended by twenty people, including four priests (not including our host, Fr John Saward), from as far away as Liverpool and Leeds. It was led, as last year, by Mr Philip Duffy, formerly Director of Music at Liverpool Metropolitan Cathedral. Mass was a votive Mass of Our Lady. Here's video showing the repeated verse of the Introit (Salve Sancta Parens); the Kyrie and the beginning of the Gloria (Mass IX). Assist at Sung Mass for the Queenship of Our Lady in the private chapel of this historic hosue, where the Faith was kept alive during the years of persecution. The house is on the 'Oxford side' of Reading. 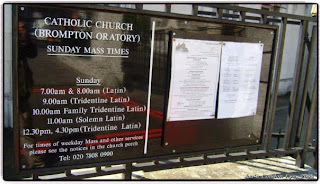 The Rosary is said by the entrance to the John Radcliffe Hospital, next to the Catholic Church of St Anthony of Padua, Headley Way, where meanwhile the Blessed Sacrament is exposed. The JR is the only place in Oxford where abortions take place. See Streetmap.co.uk here. Yes! You can do both. Places still available. Programme confirmed. Please support this Mass in a historic Catholic house. It has been in Catholic hands since 1764; the Chapel was consecrated by Bishops Challoner in 1771. 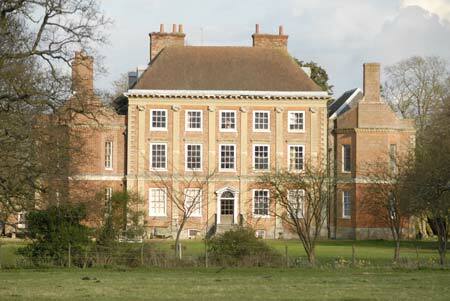 A number of Challoner's possessions are kept in the house. To find Milton Manor, turn off the A34 for Didcot (etc. ), between Newbury and Abingdon, and follow signs for Milton. The village is very near this interchange. Turn left in the middle of the village for the Manor, by the Admiral Benbow pub. You can park in the drive, outside the front of the house. For more information on the Mass in Milton Manor, please telephone David Joyce on 01635 874101.
this Sunday, 3pm. All welcome! British Victims of Abortion, assisted by the Oxford University Pro-Life Society, brought the 'Silent No More' witness to Oxford's Cornmarket today. From 12 noon to 2pm a succession of women spoke about their experiences of abortion, and how it had hurt them and those they loved. It was a very moving witness to the damage done by abortion, and was seen and heard by an enormous number of people in Oxford's busiest shopping street.